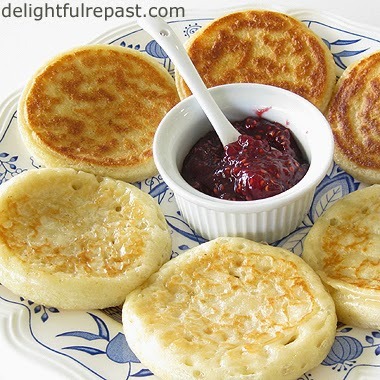 Hot buttered crumpets ... mmm ... one of my favorite comfort foods! 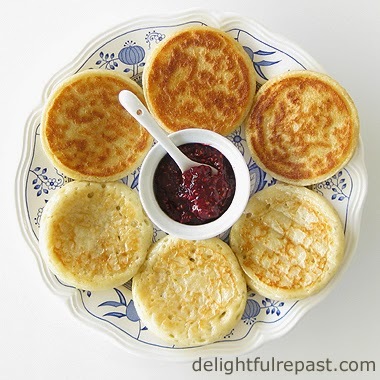 A recent request from Lana at Life at Wildberry Cottage for crumpets (a yeasted griddle cake) had me digging into my recipes. I knew it had been "a while" since I made them, but found out it has been seven years! Now that I've devoured nearly the whole batch, I can't imagine why I waited so long! Crumpets are entirely different from English muffins, though they are made very similarly with pretty much the same ingredients. Crumpets have a spongier texture and are never split. The first side is cooked about 8 minutes (or even 10, if your heat is as low as it should be) until well browned; the second side is cooked just 2 or 3 minutes until pale golden (which explains the photo with half the crumpets showing their brown first side and half showing their pale golden second side). Crumpets may sound like a lot of work, but they really aren't. 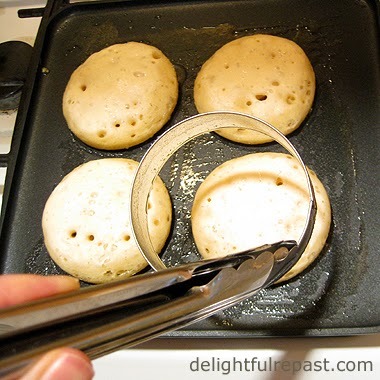 The yeast batter is very easy to make, and they are cooked on a griddle. They're really no more trouble than making pancakes. I know there are people who would have you spray the griddle and rings with cooking spray or oil them with vegetable oil, but why? The whole point of crumpets is to enjoy them slathered with butter, so why not get the party started with butter on the griddle and rings? They're great with butter alone, but you might want to also top them with honey, golden syrup, jam or marmalade. More adventurous types might even try Marmite, cream cheese or a nut butter. Needless to say, the mandatory beverage is tea! This is to show you both sides of the crumpet. The dark ones are the well-cooked first sides, and the pale ones are the lightly-cooked second sides. And be sure to put them on the wire rack dark-side down to avoid the wire marks you'll get on the softer lightly-cooked sides. 1 In bowl of stand mixer fitted with flat paddle, combine flour, yeast, sugar and salt; mix on low speed for 30 seconds to "sift" ingredients. 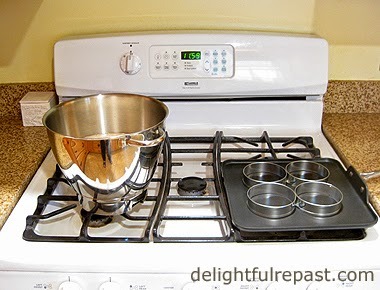 2 In 2-cup glass measure, heat milk and 3/4 cup water to very warm (120 to 130 degrees). Add to flour mixture. Beat on medium speed for 5 minutes. Cover and let rise for 1 to 1 1/2 hours, or until doubled and very bubbly. Note: You can do this with a hand mixer, or even by hand, but I'm having a bit of a problem with my beating arm just now. 3 Stir together 2 tablespoons water and baking soda, and stir it gently into the batter. Cover and let rise for 30 minutes. 4 Brush some of the melted and cooled butter on a griddle, and heat the griddle over quite low heat for 3 minutes. Brush 4 crumpet rings with the butter. Place them on the griddle and heat for 2 minutes. Pour 1/3 cup of batter* into each ring. Cook for about 8 minutes until the tops are set and full of holes. Remove the rings with tongs, turn and cook for 2 or 3 minutes until pale golden. 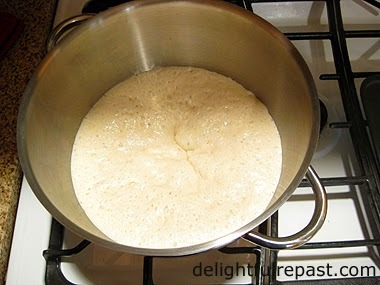 * If your crumpet rings are 3.5 inches (9 cm) in diameter, as mine are, a level 1/3 cup of batter fills them halfway. If yours are a different size, you will need to figure out what measure fills them halfway. 5 Remove to wire rack (putting the well-browned side down), and grease the griddle and crumpet rings again. Repeat as for first batch. To serve, toast crumpets (unsplit) and spread with butter. Awesome! I love making them...wish I'd been able to link to your tutorial last week for my post with crumpets! Thank you, Ruth! I missed that - I must got there now and check it out. Once again, you've come up with a recipe that seems to represent simple British baking at its best. Jean, these look amazing. Thank you. Pauline, thank you! I so enjoy remembering my mother and grandmother when I'm in the kitchen stirring up tasty British treats. Oh my, Jean, your crumpets look amazing! I have never made them but have had them with tea many times. I like them with honey. Thanks for sharing your recipe and joining me for tea. Thanks, Sandi! Always happy to join you for tea. What a great recipe and very helpful ideas. Crumpets would be something everyone should try. I copied your recipe! So glad you shared! I shall trumpet the crumpet – yet another exception to my prohibition on breads. By any name, my salivation imagination informs me that these are going to taste like English muffins, regardless of the disclaimer. Another sponge for butter! 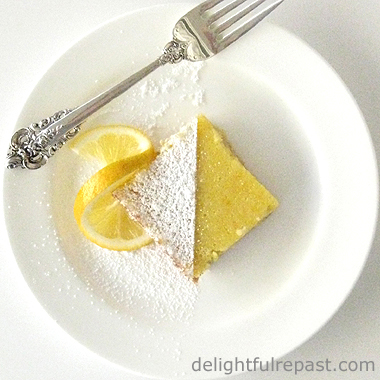 One of these days I am simply going to butter a sponge and give it a shot. But tea as the mandatory beverage? OK, I’ll pour a cup of tea…just so long as I don’t have to drink it. Bernideen, thank you! I don't know why anyone would not be into tea and tea foods, but there IS quite a little tea community out there! Sully, "another sponge for butter"? That's it, precisely! And by all means, just pour yourself a cup of tea. I'll drink yours and mine! These look good! I recently tried sourdough crumpets (total failure but I think that was partly the recipe) but I shall bookmark this for next winter so we can toast them over the fire. Anne, I'll be trying out my sourdough starter on crumpets soon. If they turn out well, I'll post them. Thanks, Maureen. When you do make them, be sure to let me know how the recipe turned out for you. These look delicious, Jean. Hope you will enjoy the upcoming weekend. Thanks, Mildred. Hope you do too! Jean I love a nice hot buttered crumpet. However, I don't know whether you are aware, but the word crumpet, has as second meaning and a certain amount of innuendo can be associated with it. Oh dear me!! Just read Sully's comment. He would have to get out of a pub here in England pretty damn quickly if he talked about crumpet in that way. There are one or two other comments that could be regarded as double entendres as well, but not as bad as Sully's comment. Ha! Ha! I am laughing my head off here, Jean. Those crumpets look divine! I am going to have to order the rings, as soon as I get them then I will start making them on a regular basis. I LOVE crumpets. I know what you mean about almost eating the whole batch, they are THAT good! Thanks so much for the recipe. Lana, thanks. Once your rings arrive and you try this recipe out, be sure to tell me all about it! Thanks, Greg! And lots of butter. These crumpets look absolutely perfect, Jean. I would love a couple of them for the breakfast. Just a thought, Jean. I hope I haven't upset, Sully. If ever he is over here I'll buy him a beer in a pub, as long ad he doesn't mention,crumpet!!!!!!! never actually made them from scratch, by them ready just to pop into the toaster. Have to have "real butter" on them.......just yummy. Love these crumpets Jean! I love anything I can put jelly on - and these look amazing! Thanks, Angie. I do, too. Wish I had put a batch in the freezer. Gill, yes, must have real butter. I don't understand margarine! Jacqueline, just hit that link in the post and order the rings from Amazon. Let me know how they turn out for you. PP, they are! And they're really easy. Kristi, you will love them! I had raspberry jam on them this time. Jean, they look delicious, especially with the jam along the side. We love English muffins, so would probably love these as well. I'll have to give the recipe a try. Linda, thank you. I hope you will. You'd love them, I'm sure. Jean, I love crumpets! Thanks for the recipe. Carol, I hope you'll make them soon and let me know how you liked them! I am a huge crumpet fan, but they are so hard to find in the US. Making them yourself is the answer! Sue, yes, hard to find, but aren't crumpets wonderful! Your recipes always look so good, and this one is no exception! Sending some foodie love your way, Jean! Hope you are having a great weekend! Michelle, thank you so much! Foodie love right back atcha! I need to make it, it is in do list for long time. Thanks for sharing with Hearth and soul blog hop. pinning. Yummy! Now my stomach is growling. Swathi, thank you! And Pins are always appreciated (I haven't quite figured out Pinterest yet!). Karen, thanks! Mine would be, too, if I hadn't made English muffins yesterday and just had one now with a cup of tea. Crumpets are such a British classic! I've pinned your recipe/tutorial to my Afternoon tea board - I've eaten plenty of crumpets in my time but never made them from scratch. I look forward to trying your recipe, Jean! Thank you for sharing it with us at the Hearth and Soul hop. Thank you, April! I do hope you get a chance to try them soon. Can't wait to hear how they turn out for you! I've never had a real crumpet, but would love to! Guess till then I'll have to settle for English muffins. Thanks for sharing with SYC. Jann, thank you! Come back on Thursday when I'll be posting my English muffins! Diva, if you ever decide to have another go, do try my recipe. I think it's detailed enough that you can't go wrong. I have to make them, I don't have access to any good shop bought ones. Oh Jean, they look so scrummy! My other half would love those smothered in butter! Rachel, thank you! You'll find lots of scrummy teatime treats here--it's what I do, it's who I am! Thank you, Zaa! I'm so glad you're going to make them. Let me know how it goes.